Support your favourite team and don the colours of “The Boss” with team jerseys and shorts as you cheer from the home or away stands. 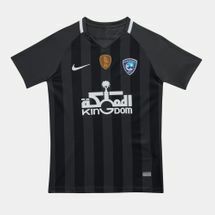 Featuring jerseys and shorts that are aesthetically pleasing, the Nike Al Hilal collection is even technologically advanced to keep you looking and feeling both cool and comfortable on and off the pitch. The Nike Al Hilal collection we house boasts not only the best in quality and functionality but also holds a sacred place in the history of regional football. Al Hilal FC wasn’t always known as Al Hilal and unlike other teams, it didn’t have a slow beginning. Immediately after being formed in 1957 and being named as the Olympic Club, their name was changed to Al Hilal FC a year later by King Saud Bin Abdul-Aziz and within a span of 3 years from then, they won their first trophy, the King’s Cup after spending all those years in building a formidable squad of talented players. After attaining their first trophy they announced their arrival into the world of trophies and they did just by winning a total of 50 official competitions. They even won the inaugural season of the Saudi Premier League in the 1976-77 season. And after that, in the next 32 years, they were winners another 12 times and runners up another 12 times – always staying in the top 2 of the table for as long as they could. This spoke of the calibre of the team that Al Hilal FC was and is even today. Join in on the Al Hilal FC hype by getting yourself official team jerseys and shorts for yourself and your kids with our Nike Al Hilal collection. Shop online now and have the products of your choice delivered to your home in or anywhere else in .